It’s no secret that the Caribbean’s rich, vibrant, and colorful history extends to its plentifully flavorful foodie havens—of which there are many. From internationally renowned gourmet offerings to classic beach bars, this is an area well known on the world stage for its delicious diversity of fresh ingredients, creative combinations, and unique local cooking techniques. 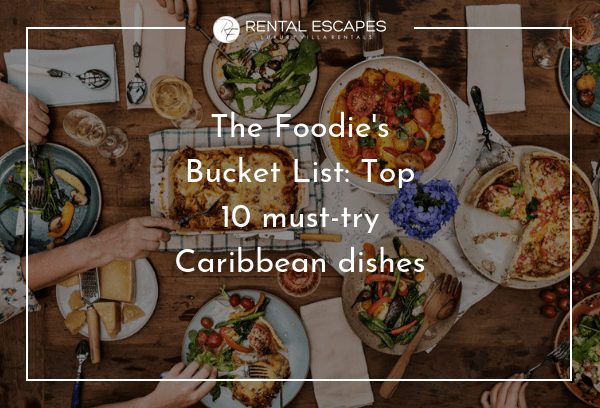 If you’re planning a tropical getaway that puts food first, consider the following top 10 must-try Caribbean dishes that should not escape your palate! If exploring St. Martin for the first time, it won’t take long to see why people travel from all over the world to savor local dishes influenced by the incredible French-Creole combination at play on the island. Be sure to try the conch and dumplings when you’re there. This must-have dish is on the spicy side and features local conch (a large sea snail) seasoned with herbs and cooked in a pressure cooker until soft and succulent. It’s often served with yummy cornmeal dumplings and topped off with gravy. Hungry yet? The annual St. Barth Gourmet Festival features the island’s renowned French and international gourmet cuisine, but beachside hubs serving up classic Creole dishes to hungry crowds can be found just as commonly as four-star joints in St. Barths. Be sure to try the stuffed Christophine (aka Chayote squash) when you see it offered. The squash has its flesh removed, is mixed with langouste and veggies, re-stuffed into the shell, topped with cheese, and grilled to perfection. Maya’s in Gustavia reportedly makes the best on the island. Barbados is sometimes referred to as the culinary capital of the Caribbean, although the competition is, of course, fierce. When visiting this unparalleled beach destination, be sure to savor the national dish: cou cou and flying fish. What is it? Cornmeal grain and fresh okra, of course, accompanied with a savory stew of flying fish seasoned with fresh onion, garlic, thyme, tomatoes, and pepper. Get it hot at Brown Sugar Restaurant just south of Bridgetown. With over 70 restaurants covering its 30 or so square miles of island, it’s said that Anguilla has more gourmet restaurants per acre than Manhattan! Internationally recognized wine cellars and chefs offer some of the region’s finest culinary experiences. The island’s seafood is caught directly off the coast and served fresh each day, for starters, which means you’ll find a variety of local dishes inspired by the sea. Lobster Mac and Cheese at Straw Hat, for example: the sweet lobster meat combined with creamy Mac and Cheese is a marriage made in heaven that food lovers can agree on. Food is definitely among the many reasons people come to visit Turks & Caicos. The combination of traditional dishes with Caribbean and international influences means that if you know where to look, you will not be disappointed. Hole In The Wall in Providenciales is a local favorite for lunch and offers oxtail stew, a classic Caribbean dish that is rich, meaty and guaranteed to keep you energized for the day. It can be a bit messy, but is worth every bite. Don’t be shy to use your hands! The Cayman Islands is known for its delectable ocean-to-table cuisine and a sustainable approach to food. Located in the Cayman Islands Yacht Club is Morgan’s Seafood Restaurant, a must-visit for its sophisticated yet laid-back energy and a wonderful view of Governor’s Creek. Its husband and wife team deliver the freshest fish caught daily by their own fishermen. Do taste their mouthwatering fresh-catch ceviche in all its delicious, citrusy glory, and throw in a slice of key lime pie for good measure. When you combine the culinary practices of the Arawaks, Africans, Europeans, East Indians and Asians with a unique mix of local and imported ingredients, you have the incredibly tasty smorgasbord that is traditional US Virgin Islands cuisine. Here you’ll find everything from mangoes and scotch bonnet peppers to spiny lobster and bulls feet! Be sure to have a bowl of kallaloo. This thick soupy stew is made with spinach, okra, and local native greens as well as a choice of conch, crab, fish, salt beef, or smoked pig tail for that extra kick. Jamaican cuisine is among the most well-known and popular of Caribbean foods, with good reason. In addition to its famous jerk chicken, visitors to this delicious land should not pass up a chance to taste some ackee fruit and saltfish (cod)—the national dish of Jamaica. Traditionally, it is served as breakfast on special occasions. Ackee fruit looks like scrambled eggs and is cooked with the salted fish and then served with dumplings, fried breadfruit, or yams for a seriously delicious flavor fusion. The Caribbean island of Antigua was founded on fine food, Antigua in recent years has become a culinary destination due to its astounding wealth of ocean-fresh seafood, and its high-quality rums, not to mention, the friendly people everywhere. Ducana is a must-taste Antiguan sweet potato recipe, made by wrapping a banana leaf around grated sweet potatoes and coconut and then steaming it. The result: a positively delicious dumpling. Subtly sweet and spicy, the ducana pairs perfectly with common dishes like saltfish or conch. From its fresh daily catch to the plumpest mangoes and avocados from its lush interior, the gorgeous island of St. Lucia is blessed with many fine restaurants and an ample supply of top tier rums. Green figs and salt fish is the national dish and uses St. Lucia’s biggest export: green, unripe bananas (aka by locals as “figs”). In this dish, the figs are peeled and boiled in salt water and then mixed with delicious boiled or flaked cod, sautéed onions, peppers, and fresh herbs and spices. You’ll find it on the menu in most restaurants on the island. Bon voyage, and bon appétit!